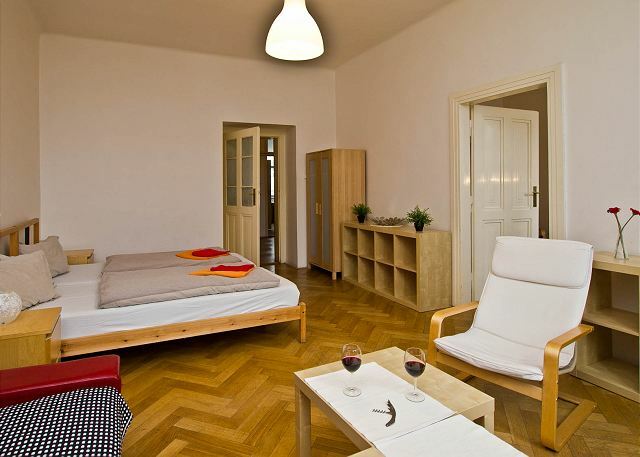 Synagoga is a bright, spacious and quiet apartment, superbly located in the heart of the old Jewish quarter. It is modern and nicely furnished for 5-7 people. 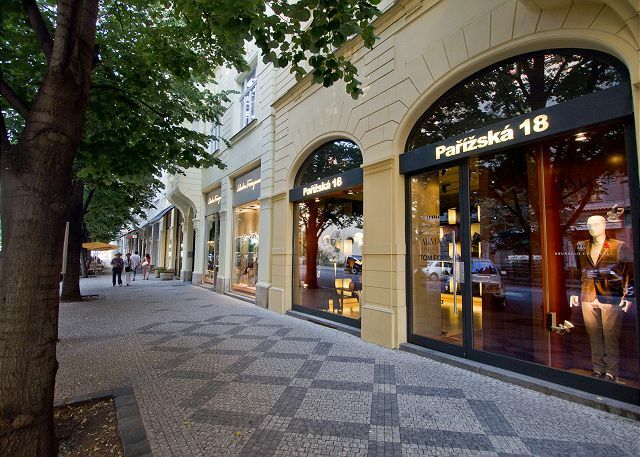 Apartment Synagoga is located 30 meters from the famous Parizska Street, fashion and luxury brands lovers can enjoy most of the world's fashion shops (Luis Vuitton, Fendi, Prada, Hermès, Dior, Cartier ...). Please note that the apartment is located on the 4th floor without an elevator, which is compensated with a view of the Old Jewish Cemetery and the roof of the former ghetto. 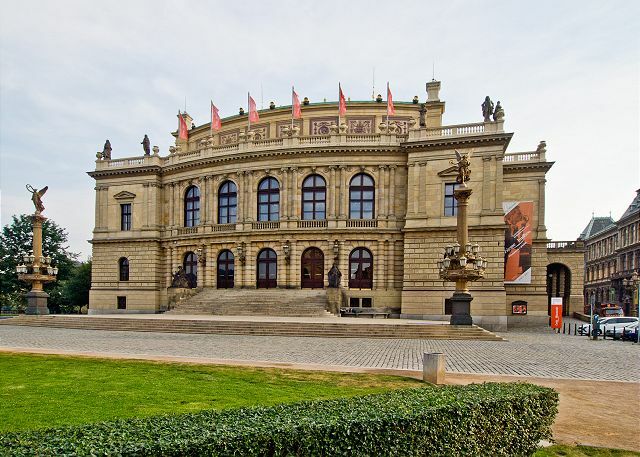 It is also an excellent starting point for exploring Prague. 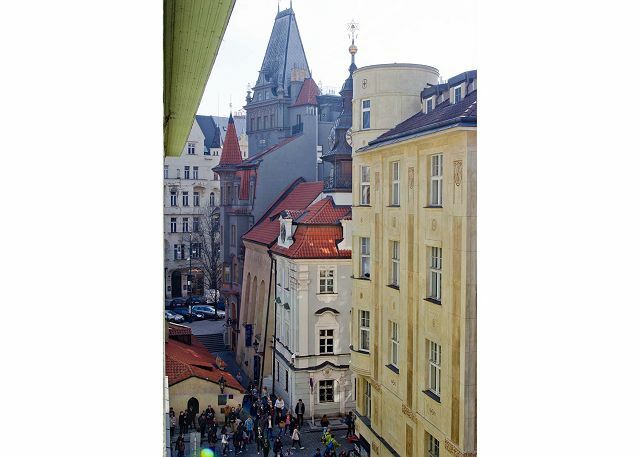 The apartment is literally a few steps away from Old Town Square and close to all the sights and cultural attractions. You can also enjoy spending an evening at one of the nearby restaurants or bars, which are all only a few minutes away. Right from the apartment window, there is a beautiful view of one of the most important preserved Jewish cemeteries in the world. Most Jewish cemeteries have been built outside of an inhabited area. 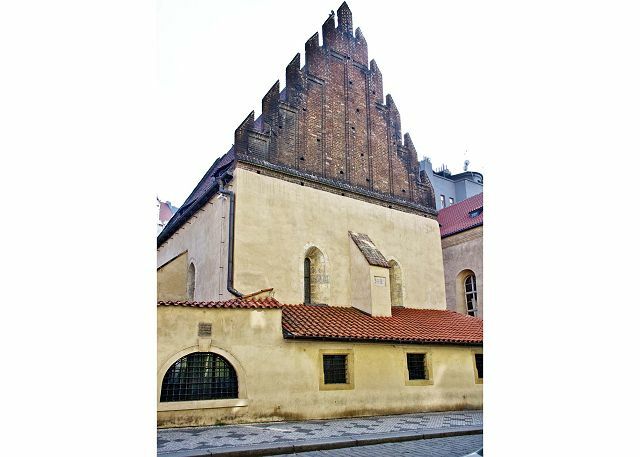 Prague’s Old Jewish Cemetery is an exception, because it has become a part of the Jewish Quarter over the years. 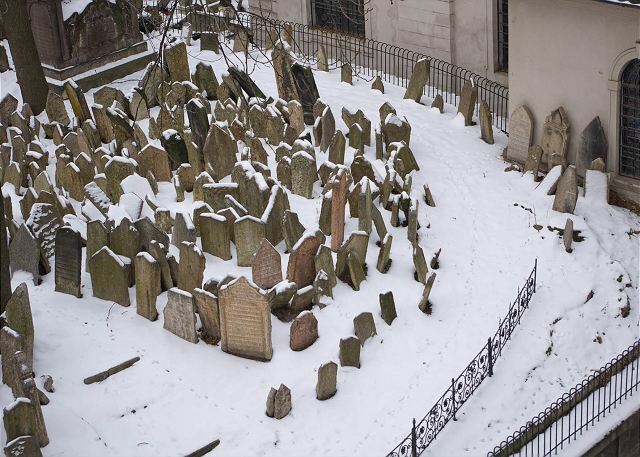 It is the youngest of three Prague Jewish cemeteries, but others do not exist anymore. According to historical data, there are 12 levels of graves underground and there are approximately 12,000 dead resting in the cemetery. Unfortunately, the cemetery had to withdraw from expanding because of Prague’s traffic in the area now known as 17.Listopadu Street. The oldest tombstone dates back to the first half of the 15th century, but most attention is given to the grave of Rabbi Low, where visitors may lay little stones with their wishes. During the time of Rabbi Low a plague broke out in the Jewish ghetto, only small children died because of it. The legend says that every night little children danced in the cemetery, they could not find peace until a mother who had murdered her baby was punished. Today, the cemetery has no children dancing at night, so you can have a good night sleep. + Secured parking within 5 minutes walk from the apartment. - Some renters smell an odor in the dining room. Synagoga flat is spacious, we were 4 but il can be ok for 6 persons, this flat is very interesting if you want to visit the old town. We did everything walking around.However, people who want to rent this flat must be in a good physical condition because he is on the 4th floor without lift. Great spacious apartment close to everything - a perfect location to walk to all the sights. Beds were very comfortable and it was very quiet at night so we kept sleeping in:) It was very warm during our stay but comfortable in the apartment with the windows open and fans. We rarely saw anyone else in the building, outside in the street below were lots of tours and souvenir shops for the Jewish cemetery and synagogue. 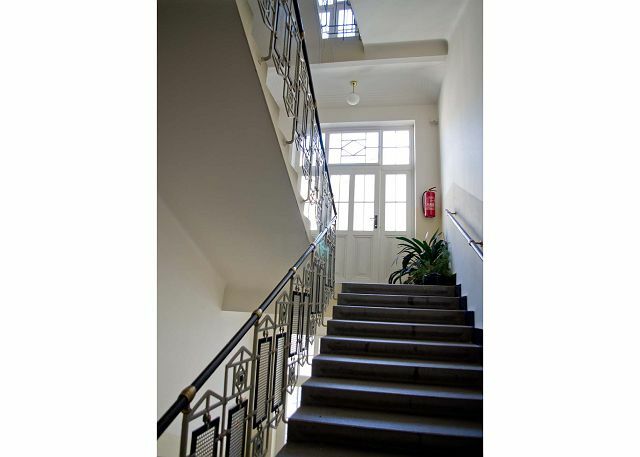 Be prepared to climb stairs - the stairway is nice and wide and well lit but the apartment is on the 4th floor! We were very satisfied about the apartment. It was a pleasure being so closed of the old town. Week end inoubliable , appartement très propre , très bien situé , avec de grand espace . We had a wonderful experience renting. The place we stayed was plenty big and had everything we needed. 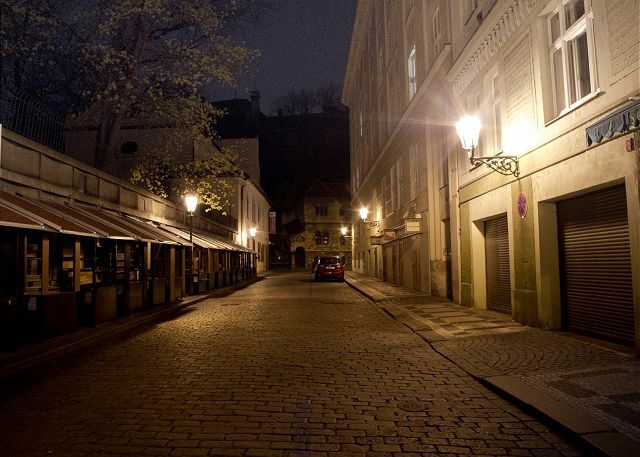 It was located close enough to all the major spots that you’ll want to see In Prague. It was easy to access and anytime I had questions, I got responses right away. It was a pleasure renting with Rentego and I would highly recommend it. This is a must stay place in Prague. Was close to everything and the staff was very helpful especially with receipt of the key posted overseas. On the top floor with a great view (note no elevator but the view is worth it) and close proximity to the train station (we used Uber and is was not an expense ride at all). 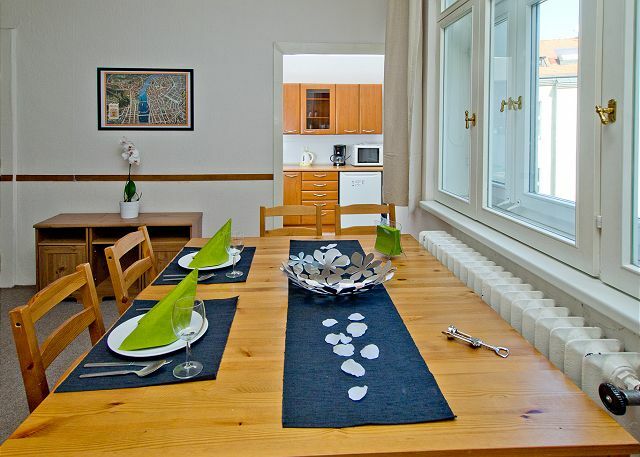 Walking distance to the Charles bridge, Prague castle and historic center. Staroměstská metro stop real close. 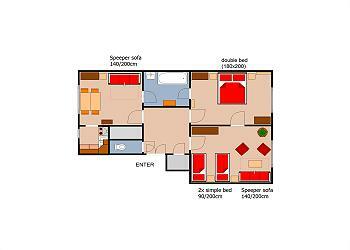 An excellent apartment, with everything you could need for your stay. Clean, nicely furnished, with a well-equipped kitchen. I particularly enjoyed the mobile Wi-Fi router provided which allowed me internet access wherever I took it. The view over the Old Jewish Cemetary is really nice, and although there is a busy street below (during the day) I never heard any noise from there. One tip : when taking the rubbish out at the end of your stay, prop the door to the courtyard where the bins are open, otherwise you might find yourself locked out (like I did)! La posizione della casa è perfetta, ci si può muovere per il centro della città a piedi e raggiungere le mete più turistiche anche a piedi! La casa è spaziosa e pulita ed è fornita di tutto il necessario! L’agenzia è molto disponibile! Wunderbar zentral gelegen, alles in Fußreichweite. Sauber, großzügig. Uneingeschränkt zu empfehlen für 5 Personen bei Übernachtung in zwei Zimmern (2+3), ansonsten wäre ein Schlafraum gleichzeitig Aufenthaltsraum und Durchgangszimmer zum Bad. Toilette in jedem Fall aber seperat erreichbar. 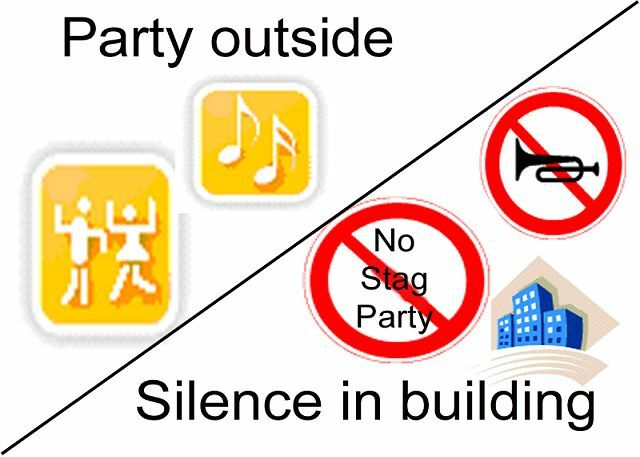 Hervorragende Internetmöglichkeit: funktionierendes Wifi in Wohnung plus mobile Wifimöglichkeit überall in der Stadt. I submitted my review a few days after returning home from Prague. Was this not received? The apartment was completely satisfactory for our needs and expectations. I had excellent service and information from the owner company. The apartment is well located for transportation in Prague and I would give it my full recommendation. Nous recommandons vivement cet appartement. Il est grand, propre et bien équipé. De plus, sa situation dans la vieille ville est idéale pour rayonner à pied. Il est situé au 4ème étage sans ascenseur. In der großzügig geschnittenen, hellen Wohnung haben wir uns mit 5 Personen sehr wohl gefühlt. Die Küche ist gut ausgestattet, außerdem ist es günstig, dass Bad und Toilette getrennt sind. Die Wohnung war sehr sauber und ordentlich. We stayed here with 4 adults and two kids. This apartment had everything that we needed. The location is superb, everything is walking distance. 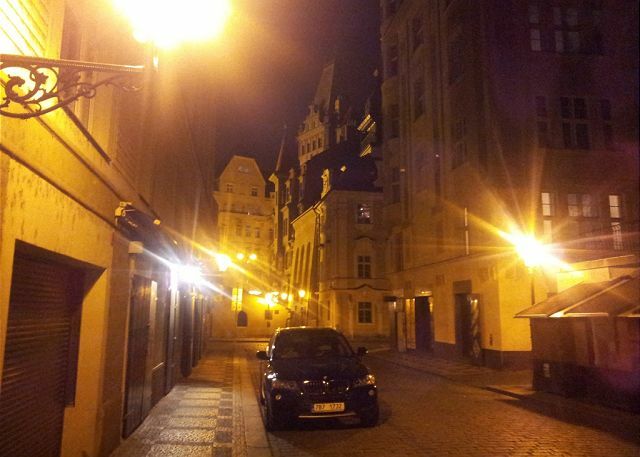 It is nice and quiet at night, and lively during the day. I loved that a washer is in the apartment - fabulous for a longer stay! I would recommend using their drivers for pick up from the airport, to be dropped off at the apartment. Nice apartment, very well situated. No TV, but not a problem for us. 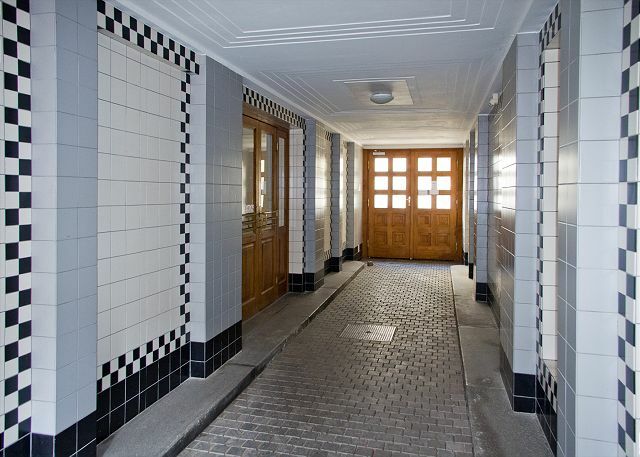 The location of the property is great, but the property itself is a flat in an older block (1930s I think) with a rather odd layout that makes it less pleasant as holiday accommodation than I'd have liked. (To be fair I should have been able to work this out from the plans very helpfully provided by Rentego in all material.) Two bedrooms are large, but what is shown as a third bedroom is actually a dining room and the only access to the kitchen, so not much use as a bedroom. The one bathroom is only accessible via one of the bedrooms or the dining room, and the WC is separate (accessible from the hall) but has no basin to wash one's hands in. Perhaps such a layout was acceptable or normal in the 1930s but seems rather uncomfortable now. The furnishing was OK, the kitchen not very well-equipped (no proper oven as far as I could tell), not that we used it. There was only a minimum of basic foodstuffs (coffee and sugar) set out for renters - fortunately there was a shop reasonably near by with moderately late opening. The company very efficiently dealt with a problem about gaining access to the apartment which was my fault - full marks to them for that. Reservation was easy and uncomplicated. The location was very good for shopping possibilities and restaurants within easy walking distance. Appartement très fonctionnel, très propre, et surtout bien situé. Nous avons visité la ville à la marche seulement. Seul inconvénient, il n!y a pas d'ascenseur. Si vous êtes en forme, ce ne sera pas un problème. Aussi, nous avons eu un très bon service, des réponses très rapides à nos questions. Et Prague est tellement une belle ville. Merci! Merci beaucoup Steeve. À la prochaine! Unico neo: 4 piani di scale senza ascensore !! The stay went beautifully. The apartment is very well located. The staff of RENTeGO was extremely kind and helpful. They noticed that our check out time was nor the departure time to airport so they extended our apartment exit for a few hours! It was an experience that went very well and I recommend RENTeGO to everyone. Thank you for the nice review, Rita :) We are really happy you had a nice stay in Synagoga. Hope to see you next time! The space was great. Lots of room. I really enjoyed the wifi mobile device. The only things that would have made it better would have been a small freezer in the refrigerator and a TV. But otherwise it was nice. The apartment was as described; pictures and floor plan are accurate! The location was great for walking to shopping and restaurants (1 minute), Old Town Square (5 minutes) and even the Prague castle (about a 15-20 min walk). The neighborhood and building felt safe and clean. The stairs were not an issue for us but this is definitely not the place for someone with physical limitations! The apartment itself suited our needs. I would consider this a 2BR+ given that if you count the living room as a bedroom, there is no common living space to gather or eat. The kitchen was clean and had every thing you could need. There is a washing machine in this apartment (which I did not see advertised) which was great, and plenty of room to spread out the drying rack in the bedrooms! The beds were comfortable and the bedding was good quality. In terms of service, we appreciated the keys being mailed to us and the instructions to access the apartment were clear. Parking was a bit far away but if you don't have a car this clearly isn't an issue! If you are driving, this area can be a bit tricky in terms of 1 way streets and the GPS's aren't always perfect, so make sure you have an actual street map. Overall, especially given the good location and reasonable cost, we would definitely recommend this apartment! Un super appartement. Une belle découverte de location à Prague. Merci, nous nous réjouissons d'entendre que vous avez eu un séjour agréable à Prague. Very nice, spacious apartment for my wife, adult son, adult daughter and me. Pictures accurately reflect the apartment. Great location as evidenced by the many, many tour groups found outside the front door of the apartment during the day. This is not a complaint, but a reflection of the desirability of the location. My only complaint is only half a complaint. The apartment was very clean which is of course very important, but the apartment had a strong smell of a chemical that I suspect was used for cleaning. I would suggest using a solution with less of an odor. Nevertheless, would absolutely stay at this apartment again if I were to return to Prague. I would also recommend the transportation service to and from the airport arranged through the Rentego website. Thank you Richard, we are happy that you had a nice stay in the apartment Synagoga. As for the smell, it's not a detergent used by our cleaning team, however so far we have not been able to do anything about it. So for any clients who are sensitive to this, we would recommend another of our apartments in the Old Town. our vacation in Prague was great. The place was large and tidy. Thank you very much Fabrizio, feel free to contact us next time you come to Prague. A very good stay in Prague, the apartment has a fantastic position in Parizka street and a fantastic view. It was clean and pretty, not enough provided, it needs more dishes and towel for table and something else for beds. We spent a very nice stay in this Synagoga apartment very well located and agreable. I really appreciated the possibility to let our luggages 2 hours more (from 11am to 1 pm) in the apartment before leaving!! The taxi driver was a nice person, helpful when we arrived to open our apartment. 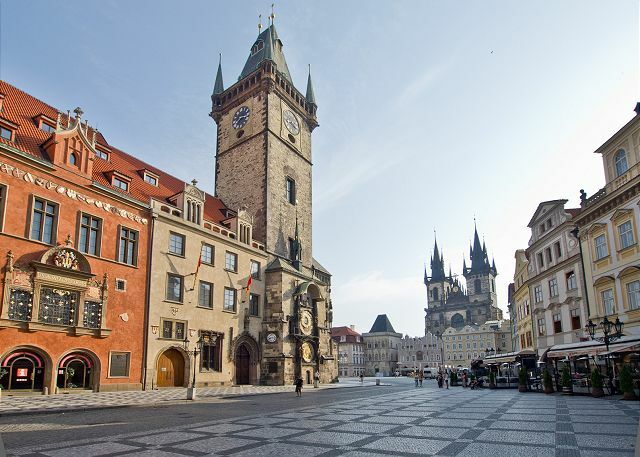 Location was perfect, smack in the centre, with just 5 minutes walk to Charles bridge. Furthermore, the staff was so wonderful with helping us out with an airport pick up and drop off, an extra late check out, etc. The appartment was bright and spacious and felt like coming home. Somewhat inconvenient were the 5 flights of stairs. Some renovation might be welcome in the appartment, but it didn't bother us one single bit. Thank you so much, Anthony. We would be happy to host you the next time you'll come to Prague! Abbiamo scelto di prendere in affitto un appartamento invece dell'albergo perché abbiamo 2 bimbi piccoli.Siamo andati con una coppia di amici, anch'essi con una bimba e c'era posto per tutti comodamente. Cucina piccola ma attrezzata. Centralissimo sia per andare a piedi in centro che per prendere i mezzi pubblici.Consigliato! Grazie mile per il suo bello comento, Gabriele! Siamo contenti che lei e i suoi amici abbiate passato un bel soggiorno nel nostro appartamento. Non esitate a contattarci per il prossimo viaggio a Praga. Sarebbe un piacere di ospitarvi la seconda volta. The apartment is just a few minutes walk from the main square so is perfectly located. The flat itself is fairly basically furnished but everything you need is there. I would have preferred a stand-up shower (there's a bath with a handheld shower) but it wasn't a big problem. The apartment is also reasonably priced. Lack of parking is probably the biggest issue in that we had to park around 15 minutes walk away. Overall cost for the parking for 3 days was about 70 euros. parfait, parfait et PARFAIT ! Nous avons passé un super séjour grâce à RentEgo ! ils sont parfaits ! ils répondent vite, en français, il sont fiables et ils renseignent parfaitement. Tout était comme décrit sur le site. Le chauffeur nous a bien transporter depuis et jusqu'à l'aéroport. L'appartement est grand et très bien situé. Rien à dire, si ce n'est que tout était PARFAIT ! The apartment was spacious, clean, and well provisioned. There were nearby restaurants, grocers, and shops. It was very close to Old Town. Our only problem was managing luggage up to the fourth floor. 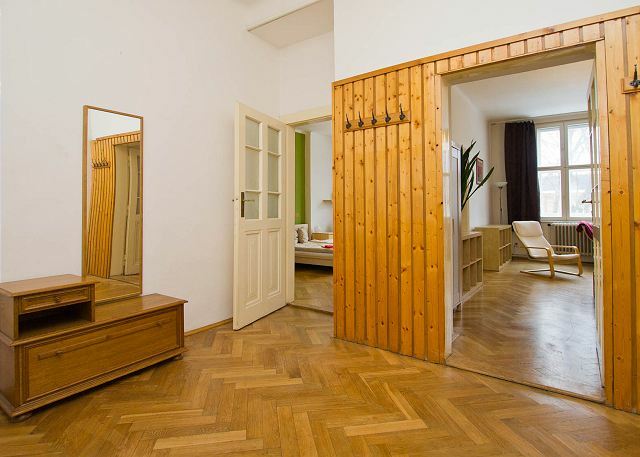 Thank you,RENTeGO team, for sending us the house key to Vienna/Austria way before we arrived at Prague, thanks for the perfectly clean apartment with all the amenities in it and space enough for us (6 adults) - just as described on your homepage. If you do not mind climbing up the four floors/storeys (there is no lift), you will have a perfect stay. There even is a good supermarket down Maiselova Street nearby. The apartment is large and well appointed for a vacation rental. As a family of four we had plenty of room, and we enjoyed little extras in the rental, including laundry detergent, tea, coffee and sugar. They also had great resources in the apartment for touring around, including a list of local shops (which did need some updating but was nonetheless helpful). Moreover the Rentego staff was professional and helpful throughout. Only downside was a slight smell, noticeable only when first entering the apartment. Thanks for all the superb arrangements. The location could not be more perfect. The apartment was in great conditions, with all the amenities you need for a visit like this, a long weekend of 3 nights. Besides the locations, we especially liked the spacious rooms, central heeting and the furniture and equipment that made us feel like home. Also spare keys were good to have, when travelling with a group. 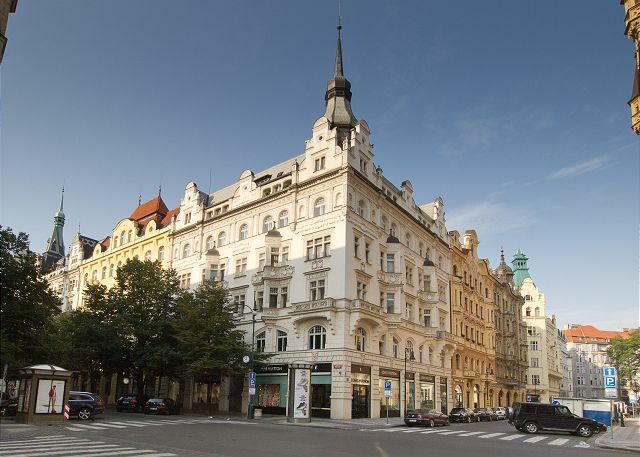 Nous avons passés de merveilleuses vacances en famille à Prague, l'appartement est idéalement placé, grand, parfait pour 6 personnes. Rentego fournit de très nombreuses informations pour vous aider. 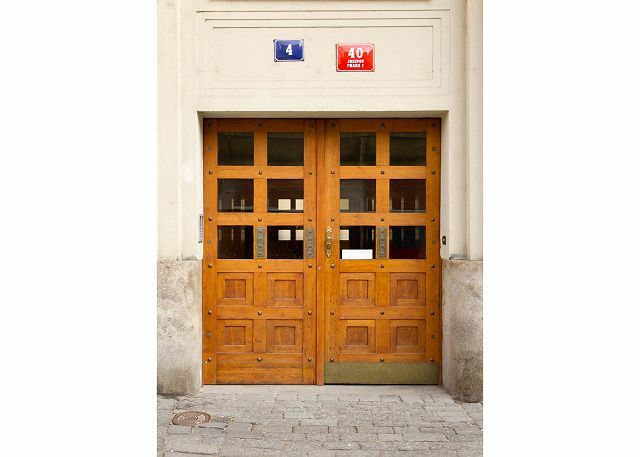 Appartement pour 5 ou 6 personnes corespondant aux photos avec de grandes piéces. Quelques améliorations en ce qui concerne la salle de bain sont à prévoir. Le quartier est trés chic et calme. 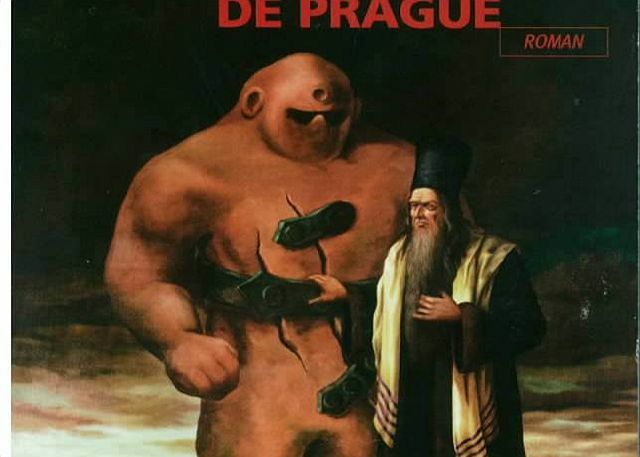 Nous avons pu visiter Prague à pieds trés facilement. A noter également en supplément un excellent service de navette privée depuis l'aéroport. We rented 4 different apartments on our trip and this was by far the best value, and the easiest company to deal with. Rentago was very easy to deal with and accessing the apartment was extremely easy. I will definitely use Rentago again. 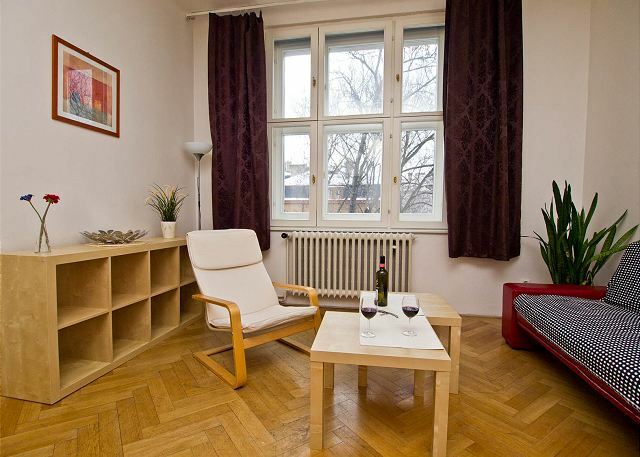 3 days located in a space appartment well located in Prague. The only problem is a special smell in the house that we could not identified but a little bit unpleasant. 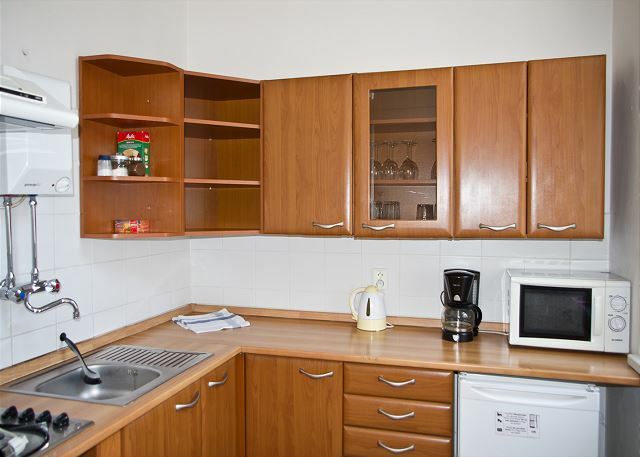 The apartment in Prague was clean, well stocked with kitchen utensils, and tourist books. 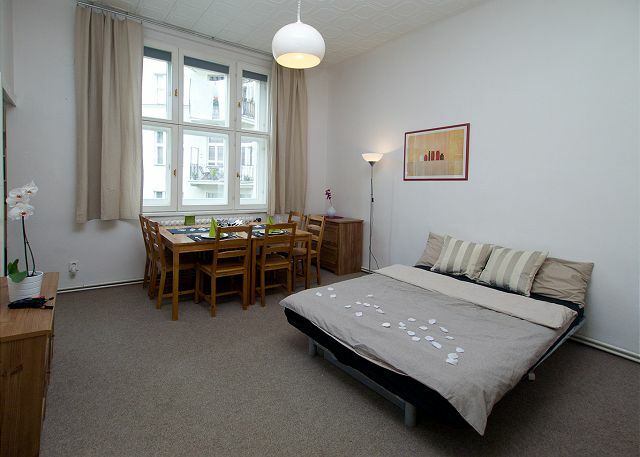 Location was great with easy access to Old Town Square and public transport. The service from the Rentego staff was fantastic, from the driver to people on the phone to responsive e-mails. 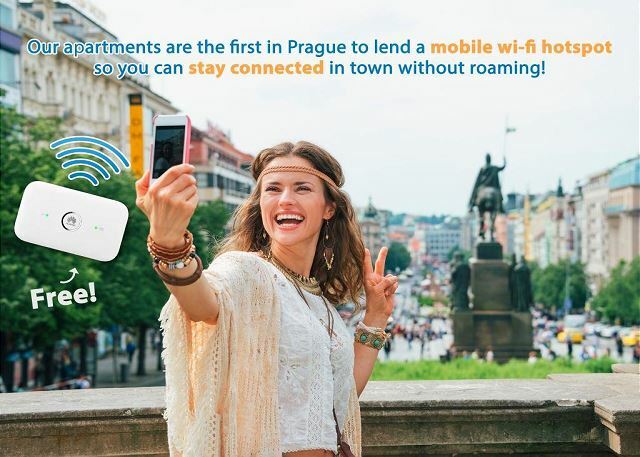 We will definitely use Rentego again when we travel to Prague. Appartement spacieux, très bien placé, silencieux, bien équipé, seul bémol: 4 étages sans ascenseur. We spent very nice time in Prague. We were a family with 3 children and property was wonderfull and very spacious. 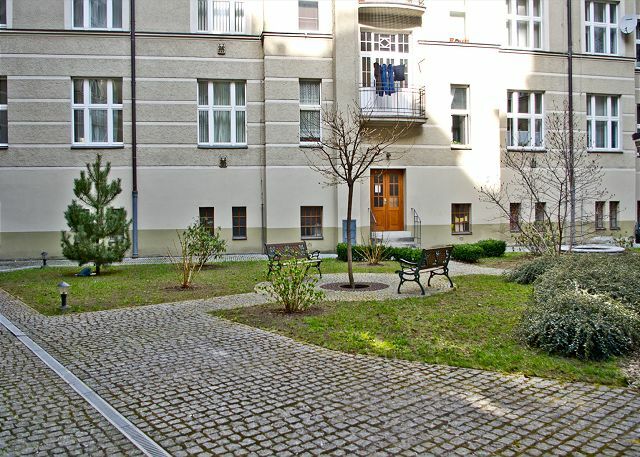 The flat's location is great (beautiful view on the Jewish cemetary), and the flat itself is very comfortable, nicely decorated with an ideal room disposition and a calm environment. The fact that one can contact the company at any time in case of need is very helpful and reassuring. Ideal conditions to have a great time in Prag! We had a wonderful stay in Prague et we were very satisfy with the appartment....but the appartment is located on the 4th floor that is a bit high for people as old as we are. Interesting experience, operated without physical meeting with the operator and specially efficient. The staff- wonderfull! Very helpful, very understanding- the best! Good location, quiet, with all the accomodations necessary. Large appartment. Très belle situation au coeur de la vieille ville, idéal pour visiter. Appartement spacieux et correctement équipé. L'équipe Rent e Go a été très professionnelle dès la réservation de la location, et jusqu'à notre départ.A recommander. Nous avons tout apprécié : la ville, la localisation de l'appartement, l'appartement !!!! les relations avec Rentego ! L'équipe RENTeGO très professionnelle. Appartement conforme au descriptif,très bien situé, très calme. Ce séjour, que du bonheur pour nous 6. 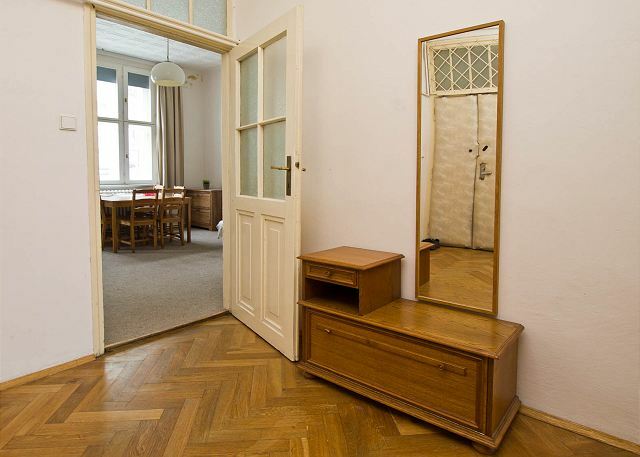 Ideal location in Prague, Large flat. Situation idéale. Vaste. Cleaning ok. Silence excellent. Well fitted. Just the problem of no lift for old people. Propreté très bien. Silence parfait. Le problème pourrait être l'absence d'ascenseur pour les personnes âgées. A part cela, le lieu est à conseiller sans hésitation. Everything was well organized by rental company. This apt was in a great location. Only drawback was the four flights of stairs that had to be climbed. Overall great experience. Allowed us to experience prague and a great city. Would definitely rent from Rentego again in the future when we vist prague again. 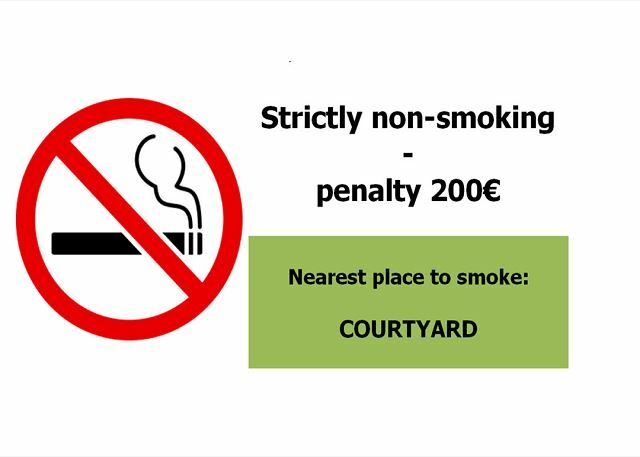 Excellente organisation, emplacement idéal, les Praguois sont très accueillants. 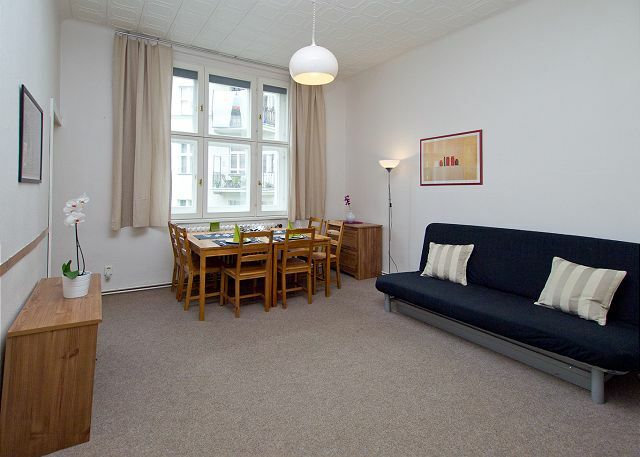 Synagoga appartment is very well situated for tourism : close to the old square, restaurants, shops, city tours etc. You can do everything by walk. A few details can be better. I was rather satisfied, only - there was a broken glass of the door at our arrival, which has to be restored. Anyway, the location made all up, it is a beautiful part of Prague city. 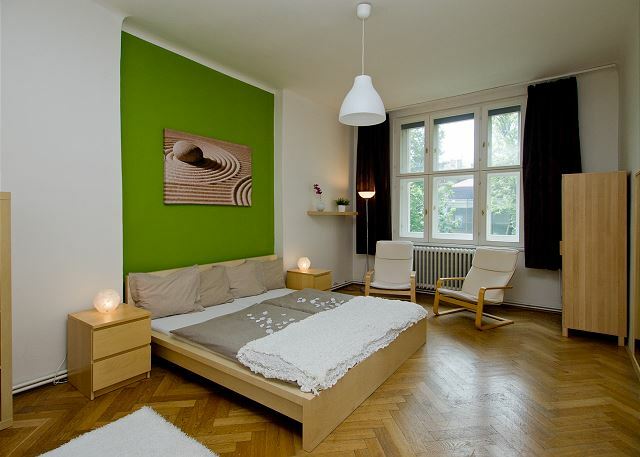 Excellently located at just 5min walk from Old Town Square. Spacious and comfortable. Charming with and old fashion vibe. The renting company is trustworthy and professional. A holder for the shower head would make showers much more comfortable! Nice experience in Prague, apartment very well alocated not far from the old town and everything arround, very easy to enjoy the city. Même si les escaliers sont parfois éprouvant, nous avons grandement apprécié le séjour. Chauffage très adéquat en période fraîche, aménagement répondant à nos besoins. Seule remarque, les appareils pour écoute de la musique non fonctionnels. Amélioration possible une télé. El apartamento en sí está muy bien. Es muy amplio, totalmente equipado y muy bien ubicado, en pleno centro de Praga. El servicio de reservas funcionó de maravilla, pues en una semana nos enviaron a casa las llaves y códigos. El único "problema" fue que había un olor en el piso durante toda la estancia, probablemente causado por algún producto de limpieza utilizado. Très belle appartement, très bien situé. On a pu visiter tout Prague à pied! The process to book the apartment was very simple, the apartment very clean, convenient, pleasant and quiet. We are couple with two teenagers and there was enough space for everybody to find its own place. Au delà de nos espérances, dès l'accueil à l'aeroport. Un appartement spacieux propre avec tout le confort prévu. We stayed at Synagoga for two nights with 7 people and we loved it! 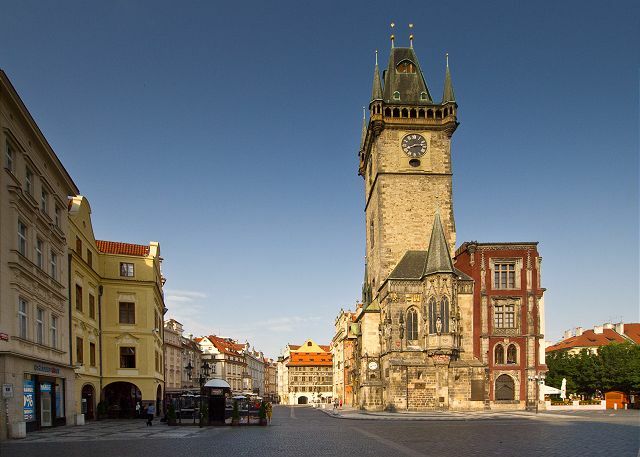 The location is perfect for Prague weekend, you can walk to all the sights and you're in he middle of nightlife, restaurants, bars. We couldn't believe that we got such a great place for that little money. Would absolutely recommend! Big flat near down town, all the main sites can be done without transport. It's near the very noisy center but it's very calm. Nous étions 4 personnes . (avis de pharmacien qui nous a vendu un gel adapté). Nous avons téléphoné au numéro indiqué en cas de problème. La personne qui a répondu nous a dit qu’elle transmettait l’info. Rentego faisait .Mais pas de réponse de la journée ni les jours suivants. Nous nous sommes organisés avec le canapé . Nous avons été surpris ,en arrivant à 15h35 pour finir nos bagages ,de trouver la porte d’entrée grande ouverte et 2 personnes à l’intérieur qui avaient commencé à ranger alors que nous avions encore nos affaires à mettre dans les valises .On aurait préféré qu’ils arrivent à 16h comme prévu. Nous avons laissé les 2 jeux de clés au chauffeur. Great property, great location. Just make sure you don't leave anything behind because the cleaning staff are so efficient that they throw it out! Cette fois encore, merci rentego pour la qualité du service. L'appartement "synagoga" est très agréable, calme, bien situé avec une vue émouvante sur le vieux cimetière (mais vous avez raison de signaler qu'il faut monter les 4 étages à pieds). Appartement confortable, impeccablement propre et bien chauffé (séjour début décembre). Grâce à vous nous avons profité pleinement de cette ville magique qu'est Praha. Dekuji a nashledanou. 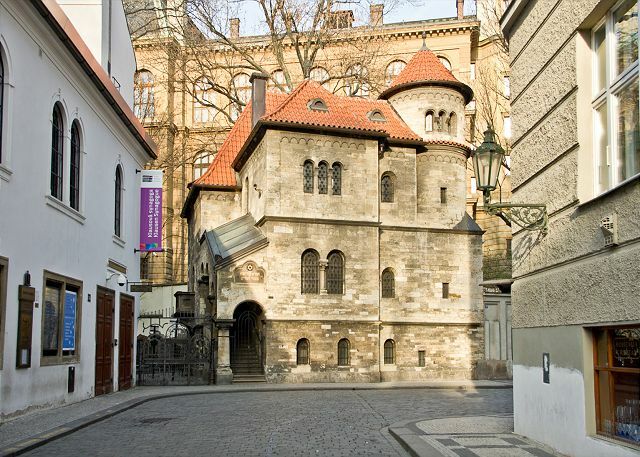 La location Synagoga de Rentago a été parfaite pour un beau séjour à Prague. L'endroit est tranquille et bien situé. Nous aurions apprécié un rideau de ****** ;-) mais, pour le reste, c'était impeccable ! Was a nice location and a nice flat,but no lift ,and a bad smell around the flat,but overall very good customer service!!! The global organization is very considerable, keys and all the information are sent at home, everything is is correctly indicated. The apartment is big, warmed and very well situated.